Last week the City of Phoenix released its second “Transportation 2050 Progress Report,” covering July 1, 2017-June 30, 2018. 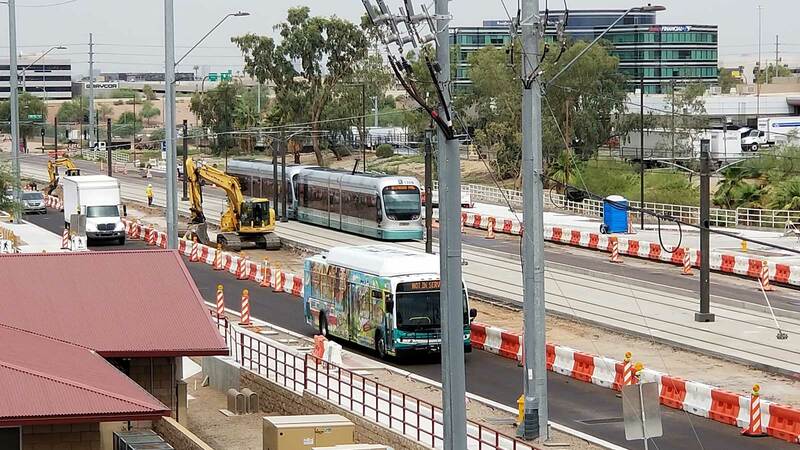 In 2015, Phoenix voters approved Proposition 104 to create a 0.4-0.7 percent sales tax increase to help fund the T2050 plan for improved street and transit service. The sales tax will generate roughly have of the plan’s overall funds, the rest of which will come from a combination of federal, regional and other local sources. The cumulative high capacity transit progress to date — covering Jan. 1, 2016-June 30, 2018 — lists several highlights. Starting preliminary planning for the West Phoenix Extension. Open 50th Street station in early 2019. 15 miles of new sidewalks developed. New roads and upgraded bridges: Complete three neighborhood pedestrian and mobility studies for major streets, design 21 new or expanded street projects, and schedule 46 projects for completion.